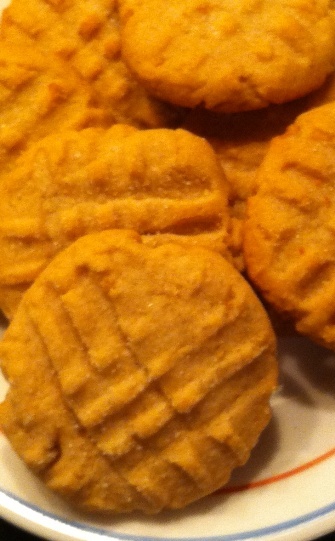 Peanut Butter Cookies have become an American homemade tradition. The first recorded cookie recipe with peanut butter appeared in Mrs. Rorer’s New Cook Book (published in 1902 in Philadelphia), which included how to roast and grind peanuts to make a buttery-type ingredient for the cookies. By 1911, peanut butter was produced and sold commercially in the United States. At that point, recipes for cookies with peanut butter began to proliferate. Earliest versions of the cookies were rolled thin and cut into shapes or rolled into balls. Criss-cross patterns on the cookies were first recorded in 1932. In a separate bowl, cream together butter and sugars together until pale and fluffy. Add eggs, one at a time, beating until the mixture is smooth. Mix in vanilla and peanut butter, scraping the bowl continually, combining thoroughly. Gradually add flour mixture to creamed mixture, adding a bit at a time and mixing until smooth. Pour about ¼ cup sugar into a small bowl. Roll dough into 1-inch balls. Place balls 2 inches apart on an ungreased cookie sheet. Dip a fork into sugar; press tines over peanut butter balls in a crosshatch pattern, one at a time, to flatten each cookie. Bake cookies for 12-13 minutes until golden brown. Remove baking sheets from the oven. Let cookies cool for a minute on baking sheets before using a spatula to remove them from the sheet to a cooling rack. Allow cookies to cool completely. Store in an airtight container. This recipe for Peanut Butter Cookies calls for either smooth or chunky peanut butter. Both are suitable. Use either depending on your taste.